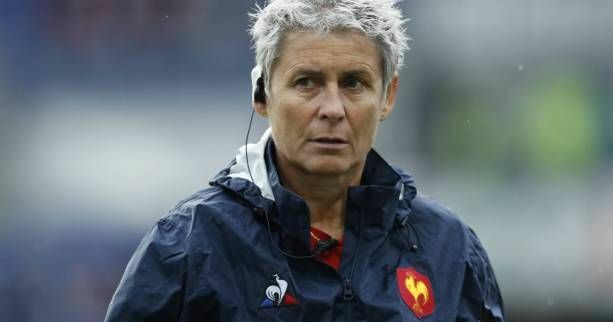 6 Nations Launch: France women's coach Annick Hayraud tells us that there are no plans for the French to follow England's footsteps and go fully professional. With England going fully professional in recent weeks, France are watching on with interest, but with 24 players holding part time contracts in their own ranks, they are not seeking to follow in their rival's footpaths. "No. That isn't what we are heading towards in France," Hayraud told us at the 6 Nations launch in London. "As far as I am concerned, if you want to have a successful international rugby player you need a good work life balance; especially at 15s with so much travel involved and so many games - they need a balance in their life. They need to have that passion but they don't need to only live and sleep rugby." She says she is happy with the current set up in France. "Around 24 of our players now have a part time contract, so for those who are studying for example they don't have to get another job - they can fill their fridges! It gives them more time to prepare and recuperate and for those who have other jobs, well they can go part time so it will give them at least a day off a week to rest or say two half days a week. It works well for us." France are the team to beat in the 6 Nations having had a hugely successful 2018, which included a magnificent win over New Zealand. Hayraud says her side will not be too concerned with any favourites tag. "How will we keep our form going? By working very hard on a daily basis and constantly pushing ourselves. That isn't just the players but also myself and my staff . The players have new contracts now so that has brought something new in and we are working with younger payers who have a lot of potential and they are getting a lot of experience. We are also looking long term and looking forward to the World Cup in 2021. It is an exciting time." The recent expansion of the Top 8 to the Top 16 has brought some criticism in France, with lots of one sided games the natrual result of so many teams being promoted at once, but Hayraud says it is working. "We are calling it Elite 1 now and this is a way to give players more exposure so they not playing just in a few clubs - they get broader experience. There were just 2/3 clubs playing at a high level and the players were not getting enough game time so the results were a foregone conclusion and that is no longer the case"
A recent report in France suggested significant drop off in young players but Hayraud says there is a system in place to keep them playing. "Again I would say, with all the pressure the players are under when they play 15 aside rugby, we do think it is important to have a balance between work, study and rugby. We have an academy for young boys and young girls at under 15 level and for U18 they play in clubs. We have 88 girls now in academies playing with the boys so that is something that is really developing players for us. Yes it is a concern but you we don't have clubs uniformly across France yet so there are obstacles in terms of location and people moving to studying."